Count down to your next event - your next vacation, your favorite band’s concert, the next movie premiere, your child's graduation, your anniversary, and more - in style! 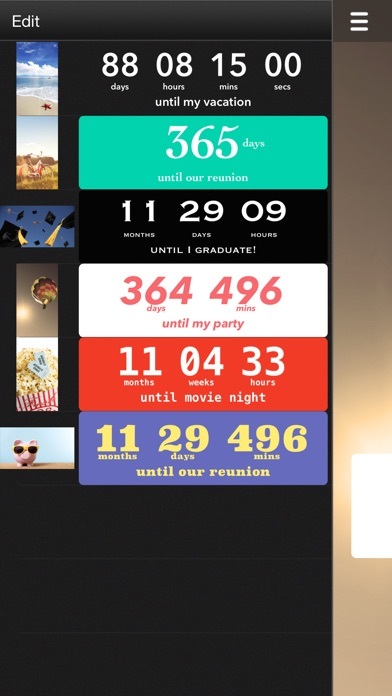 Features: • WIDGET: Quickly view your Countdowns in real-time with iOS 8! Just tap “Edit” in the Notification Center and add Countdown. • FLEXIBLE UNITS: Years, months, weeks, days, hours, minutes, seconds, and even heartbeats! (e.g. "3 months 14 mins" or "56713 heartbeats") • DRAG the Countdown DISPLAY wherever you want. • 5 FREE FILTERS for background photos! 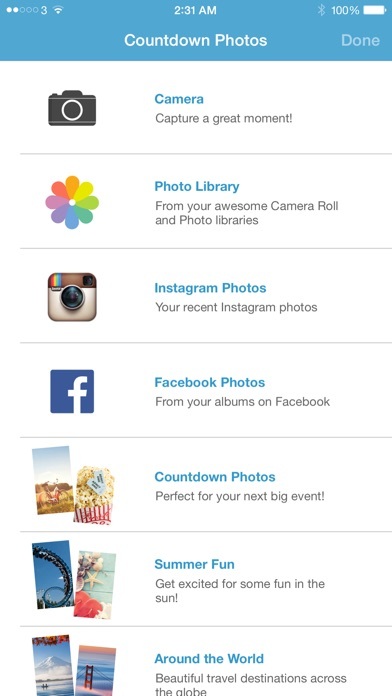 • Use YOUR OWN PHOTOS as the background, including INSTAGRAM and FACEBOOK PHOTOS! • Flip through your BACKGROUND PHOTOS while counting down. • Set your own MUSIC for each Countdown. • Customizable FONTS, font colors and background colors for the Countdown display. • Create Countdowns from your FACEBOOK EVENTS! • REMINDERS for your events. • TAG your FRIENDS when sharing your Countdown on Facebook. • SHARE a live Countdown or a screenshot of your Countdown with FACEBOOK, INSTAGRAM, TWITTER or EMAIL. • Count down to ANNIVERSARIES that repeat every year. (e.g. “25 days until my 10th anniversary!”) • COUNT UP from past events. (e.g. “21 days since…”) • SMART TOOLBAR is hidden until you tap on the screen; more screen space for your Countdowns. • Works in PORTRAIT and LANDSCAPE mode. • DAILY REWARDS. • View and save popular COUNTDOWNS NEAR YOU. === Premium Features === + Your OWN PHRASE - “the concert of the year”, “little pumpkin’s dance performance”, “we board the plane”. 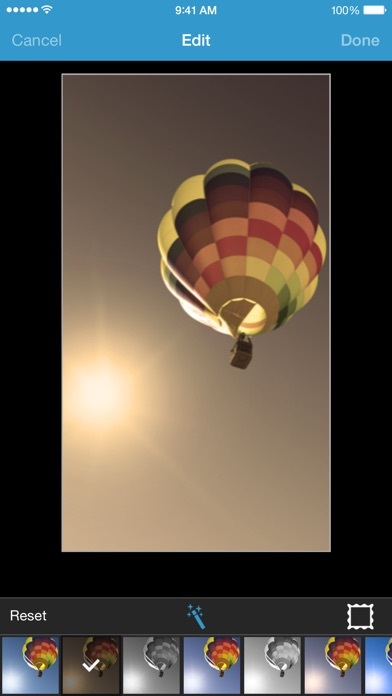 + FRAMES and FILTERS for background photos! 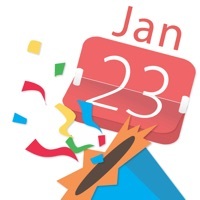 + Create Countdowns from your CALENDAR EVENTS! + MULTIPLE Countdowns (and rearrange them as you like!). + SLIDESHOW mode of background photos, with different animation styles and speeds! + PREMIUM background photos. Make each second count! I could only do one event at a time instead of multiple events. I would like to be able to put more than one event. I really like this app! The only thing it is missing for me is the ability to countdown by week days. I’m a teacher and a mom and this issue comes up pretty often. Used to be a great app. Now every time you want to do something a 15-30 second ad takes over the entire screen and you can’t get rid of it. I’ll be switching to another countdown app and recommend you do too. I made the premium purchase so I could post my countdown on Facebook only to see that stupid thing saying ‘countdown to my event’ and needing to click on it to get the countdown clock! Really? That isn’t very appealing, considering I added a cool pic and was looking forward to the visual appearing on my page. I want a refund! The biggest pile of crap app I have ever downloaded. The beauty of a fancy countdown is the ability to hype an event with friend or family. I love using this app to count down special dates with our grandchildren. By Hate the new update .-. I understand App developers deserve to get paid but you get a 10+ second ad after just a few clicks. It makes it impossible to get anywhere. Deleted immediately after download. i love this app! it is a great way to tell how long you have until an important event! I am able to share my count down on my social media and I love the backgrounds and that you can choose your own from your gallery. It’s pretty good, but if you don’t buy the premium you can’t have the slideshow effect. You also can’t have more than one count down. But that doesn’t really effect me. Works good. I use it for all major events. The app is so slow you can’t change anything on it without having to wait or restart the app altogether. It was too frustrating so I deleted it and downloaded a better one. works fine I guess, cool that you can upload your own photo for the countdown. but you have to pay to view all your countdowns on one screen, which is dumb. wish I had downloaded a different one. The app has so many pay walls it's basically just a countdown with a picture. You want a slideshow instead of picture? Paywall. You want to name your countdown? Paywall. You want to have more than one countdown on your countdown app? Paywall. Could be better; no reason for this though. I really like this app because it is much easier than looking at a calendar and counting everyday it is very easy to use and very fun. You can upload any photo as the background with a touch of a bottom, very simple and fun to use. I highly recommend this app to someone who likes to know the exact countdown of time till a certain date. I would definitely get it! This used to be such a nice countdown app, but no longer is. I recently reinstalled this app to find out that you have to pay to access most things. You are only able to have one countdown at a time. Simple and does what I need for it to do. Great app. Like that you can customize the background and the countdown. This app would be much better without the games popping up. Literally all I could ask for in this app. I downloaded to count down the days until a big trip I have, and I will almost never open the app, but just swipe right to use the widget. Works perfectly and looks good. App goes into a loop when you try to spend $2.99 to remove ads at every turn. This app has ads that can’t be removed and interferes with the countdown message. You have to pay if you want to have more than 1 countdown so you can only have one at a time. i purchased this and it’s great but i dislike that it has a limit. you can only have 20 countdowns at the same time and i think it would be better with no limit.